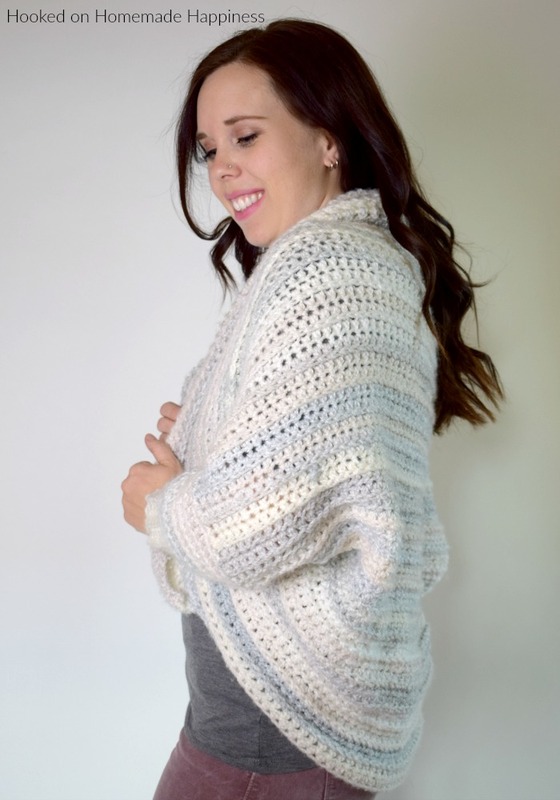 The Coziest Crochet Cardigan is made from the softest, squishiest yarn and it’s bound to keep you nice and cozy this winter! I didn’t make this cocoon sweater quite as long as I typically do because I wanted more of a cardigan type sweater. 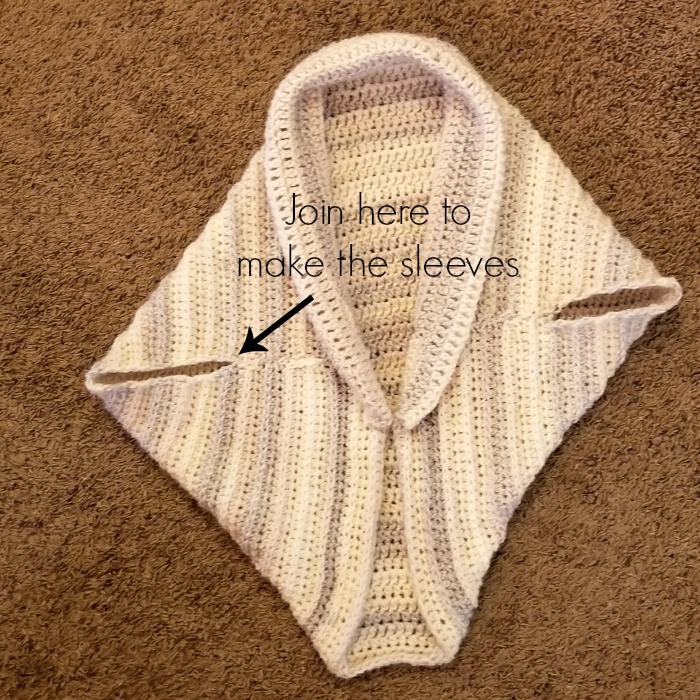 But cocoon sweaters are highly customizable! 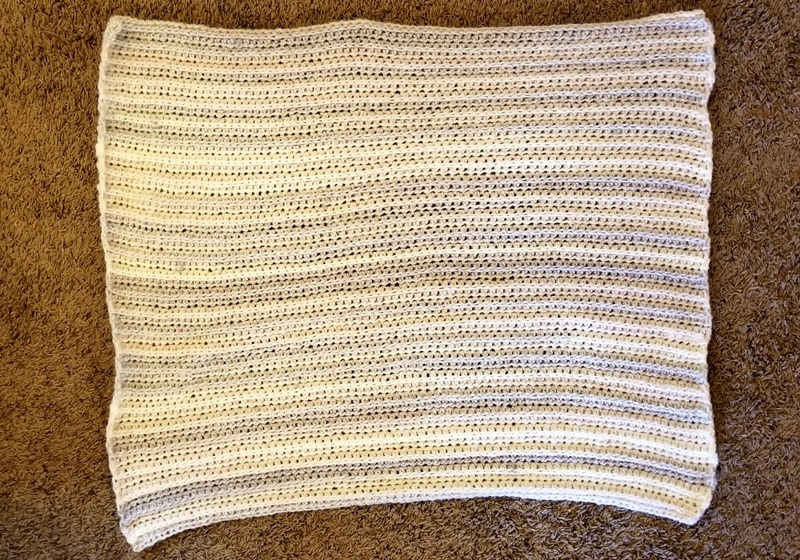 I have this pattern written in sizes small through x-large. I also have noted in the pattern where you can adjust the pattern to make it the perfect size for YOU. 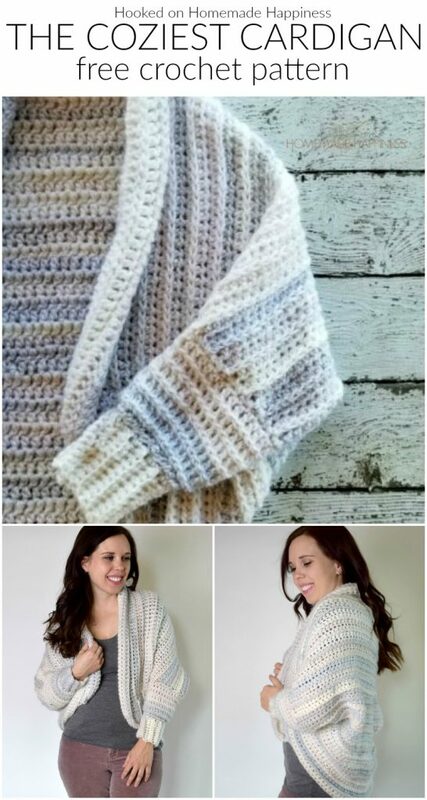 – Get the free pattern below or this pattern is available as an inexpensive, clearly formatted, PDF instant download in my Etsy shop and Ravelry Shop. Lay your rectangle out with the right side up and the rows going horizontal. Fold in half by bringing the top down. 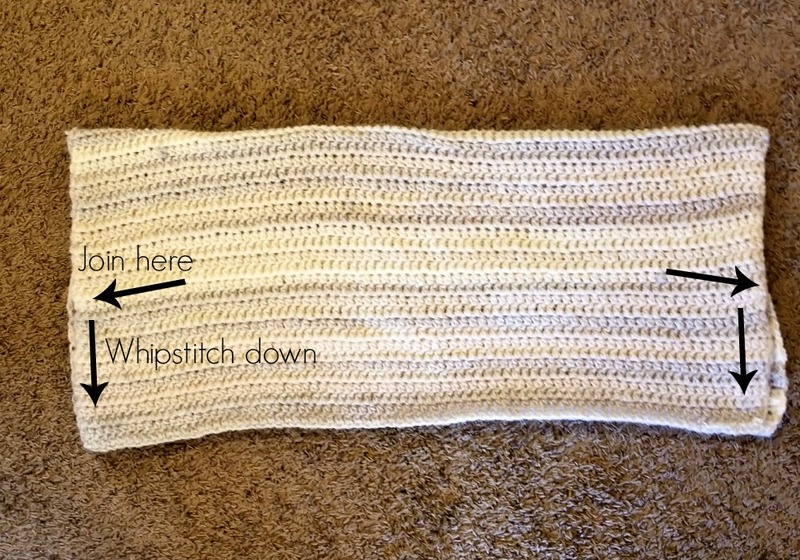 Using your yarn needle and a length of yarn twice the length your going to sew, join at the center of the side, then whip sititch down. The spaces at the top are your armholes. Pull the top half up from the center. You can see it’s starting to look more sweater like now! Fasten off, weave in the ends. Repeat pattern for other sleeve. 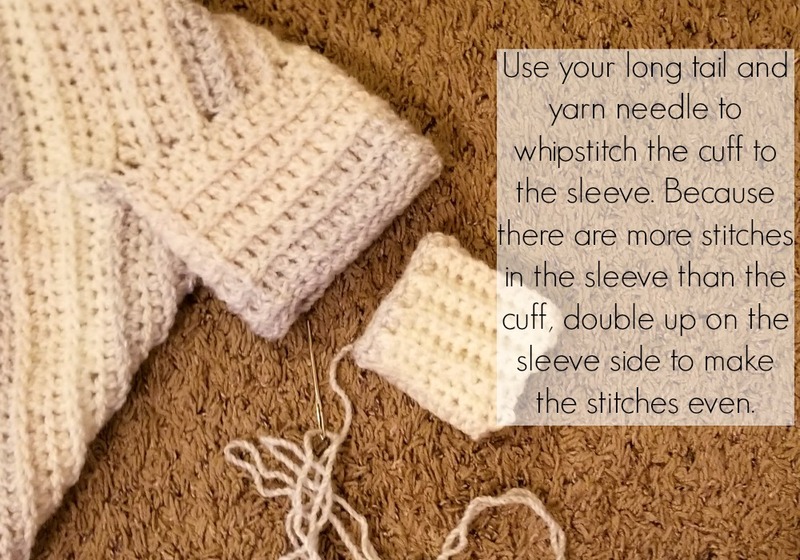 To make the sleeves longer, repeat row 3 until desired length. Test the cuff around your wrist to make sure it fits snug, add or take out rows as needed. Attach the cuffs to the sleeve by using your long tail and yarn needle. Whip stitch the cuff to the sleeve. There will be more stitches in the sleeve than the cuff. To make the stitches even, double up on some of the sleeve stitches by stitching through them twice. Hi Diane! 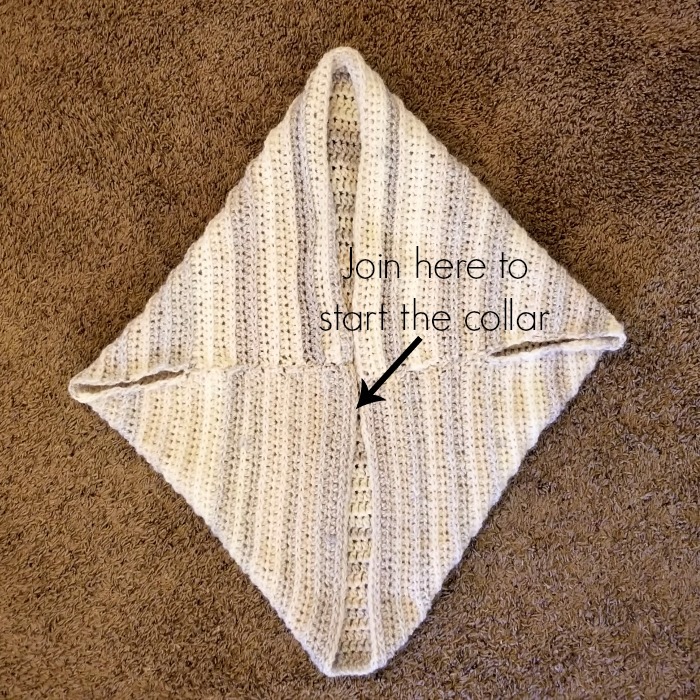 To increase the width of the cardigan you can add to the starting chain. Adding 5 will add approximately 2 inches to your width. 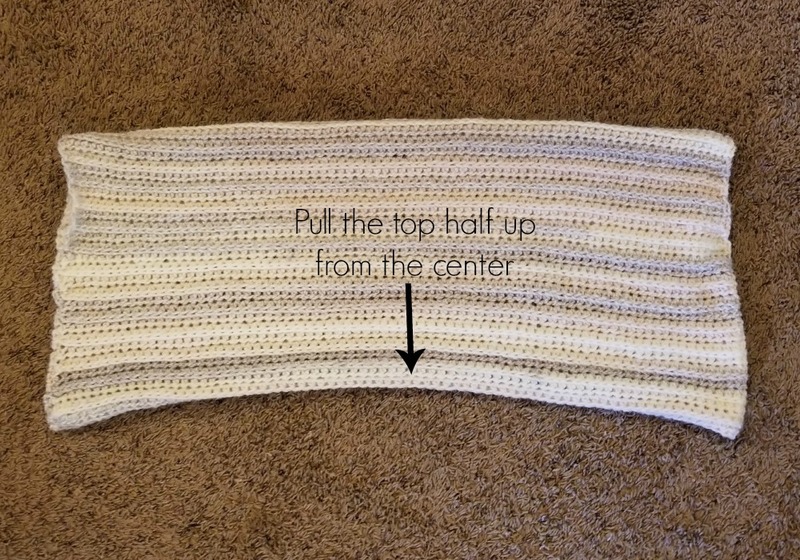 For the length, adding 4 rows will add approximately 2 inches to the length. What do you think about chaining around 112? And going to row 78? Thank you for sharing. I will make it for the winter. Do you know how many yards are in the skeins of wool you suggessted? I have 3 skeins of Loop and Threads Charisma (5) it has 109 yards per skein. Would this be enough?